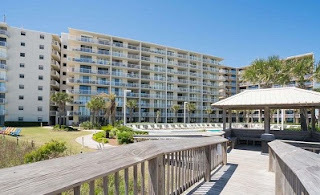 Orange Beach AL condominium home for sale at Seaside Beach and Racquet Club. This 2BR/2BA has beautiful gulf front views from the living room and master bedroom. The sellers constantly keep this unit in top condition for renters. Enjoy the water views from inside or out on the nice balcony. The complex is under going upgrades and paint and the assessment has already been paid. The complex has 2 outdoor pools, indoor heated pool, exercise room, grill area, sauna and tennis courts. Conveniently located within walking distance of restaurants & stores.